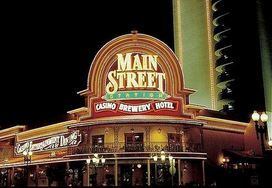 Main Street Station Hotel and Casino is one block off Fremont Street Experience. There is a pedestrian indoor bridge that connects Main Street Station with California Hotel so if You stay at one it is like having the other in Your lobby. Main Street Station is of course themed around a train station and has plenty of authentic train items on display that might interest You. The main bar in the casino is worth a walk to take a look at. The Casino is very nice and has some coin machines that are rare to find. The rooms are modern and clean and this Hotel should be on Your list of good choices in Downtown Las Vegas.